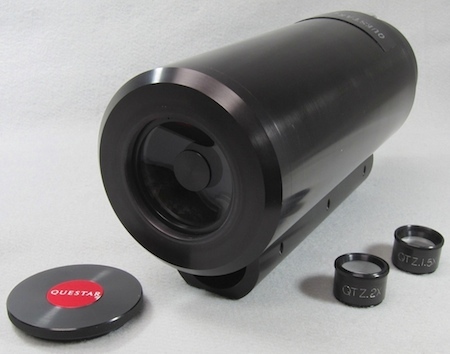 The Questar QM 100 Long Distance Microscope is designed to provide resolutions of as fine as 1 µ (0.00003937007874 inch!) or less thus making it an invaluable instrument for observing materials and biological targets located too distant from the instrument to be observed with conventional microscopes. Common applications have included materials testing (crack propagation, studies of dendrites and other surface features, quality control), studies of bubble formation and flow (fuel dispersion) within a chamber, etc. 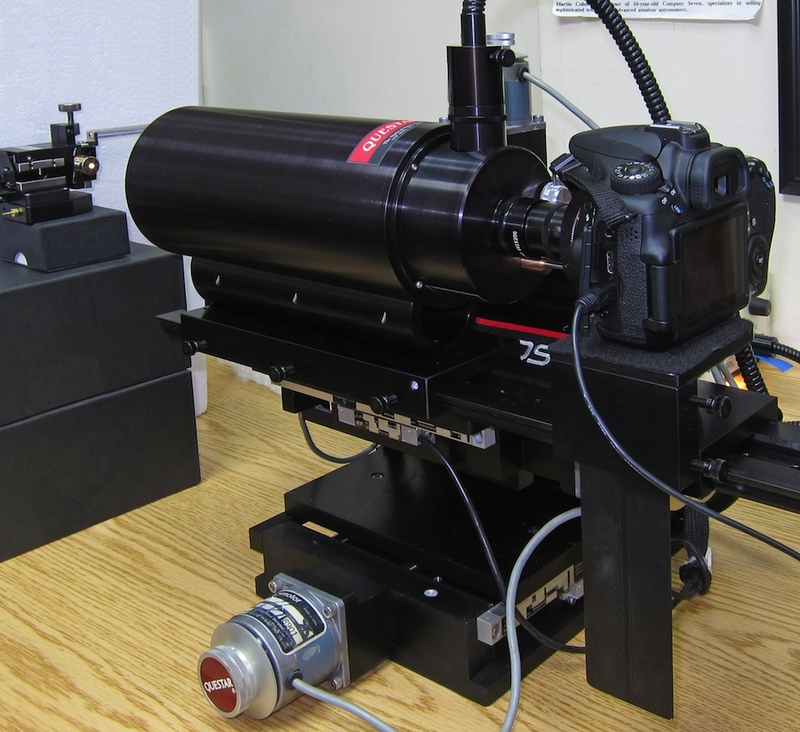 The QM-100 can be used to focus on a target directly in front of it, or located behind a transparent window (in a furnace, or in a test tube, etc.). 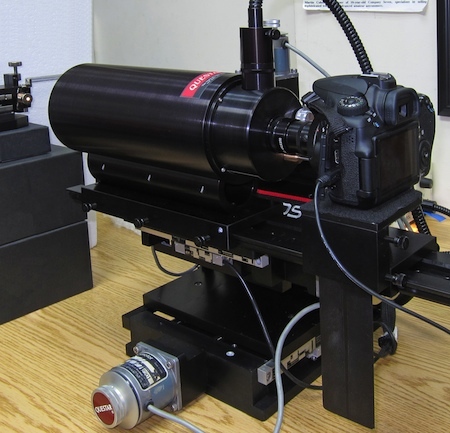 Furthermore, the QM-100 can illuminate that target using the coaxial technique, and this is among the many the advantage of these systems: one can observe the target with the Long Distance Microscope while simultaneously lighting the target through the LDM! The system is engineered to accept a diverse selection of optics to increase or decrease magnification and field of view, bandpass filter, color filters for contrast enhancement, polarizing filters, etc. 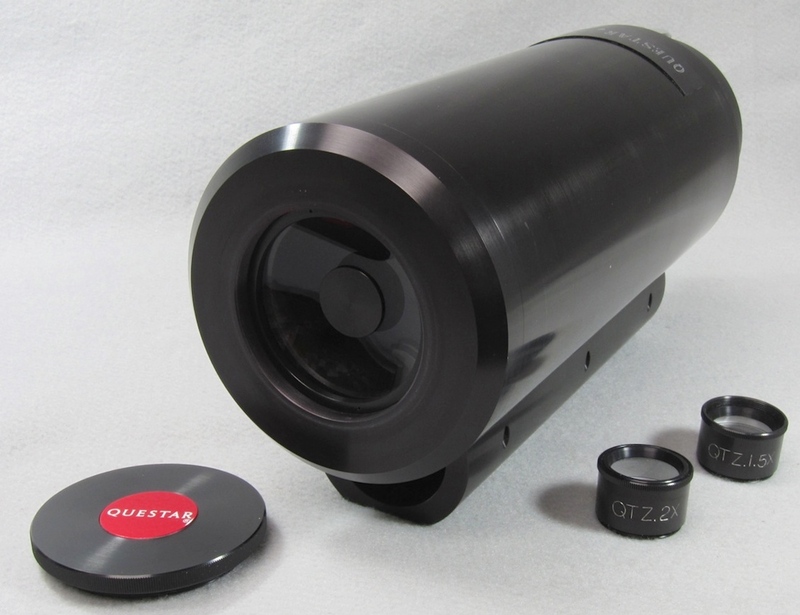 Right: Questar QM 100 Long Distance Microscope with Quartz optics and with Barlow lenses and lens cover aside at Company Seven (53,911 bytes). Click on image to see enlarged view (226,260 bytes). The Questar QM 100 combines the compactness and the ease of use of the Questar QM 1 with the relative aperture and resolution of the larger microscopes. For applications requiring high magnification and resolution, and which will allow the user to work from distances of 15cm (5.91 inches)* to 35cm (13.78 inches), the QM 100 is unrivaled in performance and flexibility. *With the optional Questar PowerPak 100 then this can be reduced to 10cm (3.9 inches)! This instrument is a completely different optical formula than the QM 1, it is not merely an adaptation of an existing design. But rather it is an evolutionary development whose concept originated with the QM 1. Note the different lighting techniques will reveal different features on the target. And use special care when lighting the experiment when working at the closest distances. Since the QM-100 optical tube assembly will be so close to the intended target of observation then conventional lighting might be obscured by the instrument or may be located at such shallow angles to the target that they will not illuminate to the desired depths, and so we recommend coaxial illumination (Fiber Optic Light Guide attached to our optional Brightfield Adapter (P/N 39170) to pump light directly through the QM-100 focused onto the target. Or consider backlighting the object if it is either transparent material or thin enough to have light projected through it. Please contact Company Seven for advice about the applications of our systems and lighting techniques. Right: Questar QM 100 Long Distance Microscope set for Co-Axial lamination of target (at left). The QM-100 is shown with optional Camera Cradle supporting a DSLR Camera, atop 3-Axis Translation Stage at Company Seven (93,016 bytes). Click on image to see enlarged view (284,148 bytes). Control Box: Cast aluminum, 24S-T4, corrosion resistant; selectable axial or 90 degree Port. Focus Mechanism: Mirror thimble integral with stainless steel (s.s.) sliding tube. Field of View 2/3" format with optional Positive Lens field of view more than 7mm are possible. Standard spectral response: 330nm to 2.3 microns, optional systems with wider spectral response available. Optional EXFO X-Cite illumination sources and accessories, including the high stability X-Cite exacte system. For this example the wavelength of light used is at the 0.546 µm HG spectral line. Perceived depths of field will vary with the user, camera, and wavelength. In general, they will increase when a camera is used. with Auxiliary Barlow Lenses, with 172mm Positive Lens, based on 2/3" format camera. Field of View (from 2.5 to 0mm top to bottom) along the left side, Working Distance (15 to 35.5cm) left to right. Top to Bottom Dashed Lines are: QM-100 with 172mm 0.9X Positive Lens (from 1.29mm to 2.29mm), at Prime Focus (1.17 to 2.07mm), with 1.5X (0.77 to 1.41mm), with 2.0x (0.59mm to 1.04mm), and with 3.0x Barlow Lens (0.41mm to 0.72mm). using a 16mm eyepiece open (at "prime focus") and with auxiliary lenses. The magnifications, other than the "OPEN" column are extrapolated data. *Video magnification assumes 2/3" format CCD and 14" Monitor. When comparing video and visual magnifications using the "OPEN" column understand that much of the difference here occurs in the artificial magnification from the CCD to the monitor; this sometimes results in "useless" magnifications. Although eyepiece magnifications appear to be significantly less than CCD magnifications, comparable resolution is achievable due to the resolution limitations of CCD technology and the exceptional physiology of the human eye. Questar QM-100, Model 30003 illustrated two page brochure describing the basic Questar QM-100 Long Distance Microscope. With tables and instrument arrangement drawings. From Company Seven's Library. Download size is 412,734 bytes (in Acrobat Reader ".pdf" format).